30 to 35 most weeks. What were some of your better/memorable races? In August I ran my best marathon, my second fastest of 17, and qualified for Boston with a 20-minute cushion. That was my first BQ, and I am over the moon excited to run it in April of 2019. Another race that stands out is the San Francisco Marathon. I tripped in a short tunnel in Golden Gate Park near Kezar Stadium and broke my arm. I finished, albeit slowly, determined to earn my medal. I finally got around to doing an Ironman 70.3 in 2017. That was memorable because the bike portion was so grueling. I hope I never have to spend 4 hours on a bike again. I’m glad I did it because it had been on my bucket list for 10 years, but doing it made me appreciate running more than ever. I just love the pure simplicity of running. How did you train differently in your younger years? In my younger years, my training was basic. I never had a coach until I was in my 50s so I just ran the weekly miles I thought I needed. I didn’t know how to train. After I became a coach about 10 years ago, I combined that knowledge with my own past experiences and what my brother had taught me. I also listen to podcasts to hear the most recent research from the experts in training, nutrition, and longevity. That’s one way to stay up to date. How do you train now? Do you attend coached workouts? Since I am a coach, I make up my own training. 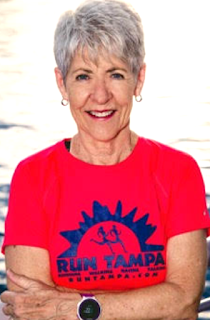 I don’t do speed work with a group, but I do a wide variety of training on my own, including intense strength training, and I host three group runs a week. So, I get a long run and two medium distance runs in with them, usually 12 to 14 for my long run, longer when leading up to a marathon, and then a couple 6 to 10 milers. The other miles are solo. Total lifetime miles? About 55,000. Has your diet changed through the years? In the last 10 years I have totally overhauled my diet, removing 98% of sugar and all processed foods. I eat a limited amount of organic meat, mostly steak, lots of eggs, cream, butter, cheese, cruciferous vegetables and nuts. No grains, fruits or starchy vegetables. Plus, I do bone broth fasts one or more days a week and intermittent fasting, always doing my morning workout and races fasted. Cross Training: Over the years, I’ve always done some strength training, but in recent years, I’ve focused on it more, particularly using free weights and kettle bells. I’m a fan of jumping rope and balance exercises, and I try to run trails once a week for the added benefit of varied terrain. In the last year, I started doing Crossfit, and discovered an immediate benefit to my running due to the variety of functional movement exercises that strengthened my core and back like nothing else has in the past. Six months after starting, I measured a half-inch taller because I managed to straighten out my back. How important is social running to you? If you were/are a competitive runner, can you adapt to the slower times and enjoy a social run? I was never an elite athlete so that’s not an issue. I lead group runs, as in, “I’m the organizer,” but I sometimes can’t keep up with the fastest people. I can hang with them a few minutes, but then I have to drop back. I do what I call a zigzag run. I start with faster people, then drop back and run with the next pack for a bit, or start at the back and then move up through the group. That way I get to spend some time with many different people. I’m much more focused on the conversation than the pace. The social aspect of running is 80 percent of the pleasure. 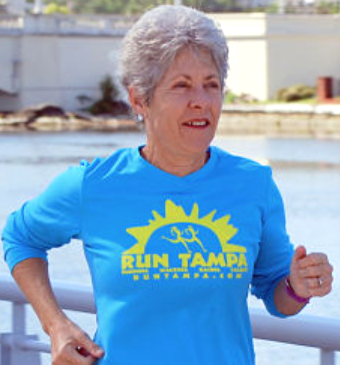 My running club, Run Tampa, has over 400 members so I always have company. Obstacles along the way: My biggest obstacle early on was being a working mom. I was an English teacher and between grading papers and raising my two kids, I struggled to find time to run. Other than that, my biggest obstacles have been random injuries, most of them not from running. I fell while skiing two years ago, and severed the ACL in my left knee. Never had it repaired, but I was off running for four months, and then I broke my big toe and tore the ligaments when I tripped over the threshold between my house and garage. It might sound like I’m clumsy, but when I look at all the miles I’ve run, many in the woods, I feel I’ve done pretty well. What are the biggest lessons you have learned from running? 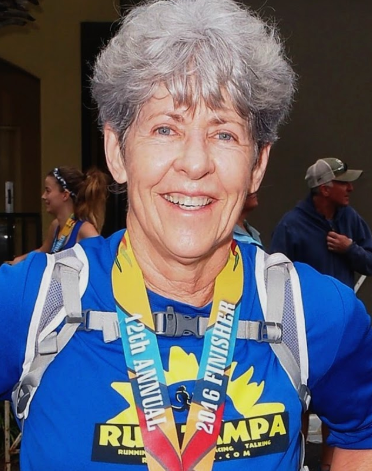 Running continues to prove to me that I should expect surprises because even after stressful or strenuous days and maybe a sleepless night, I sometimes have a magnificent run or race. Running has taught me that age means very little. I feel like I’m 30, especially when I’m with my running friends. Get regular deep tissue massages. Focus on high cadence at all paces. Running-training philosophy: Follow a sensible, well planned and appropriate schedule, but listen to your body and be willing to take a couple of days off if you start to feel extra tired or if something hurts. Always look at the big picture. It’s all about perspective. Patience, common sense and moderation always pay off.